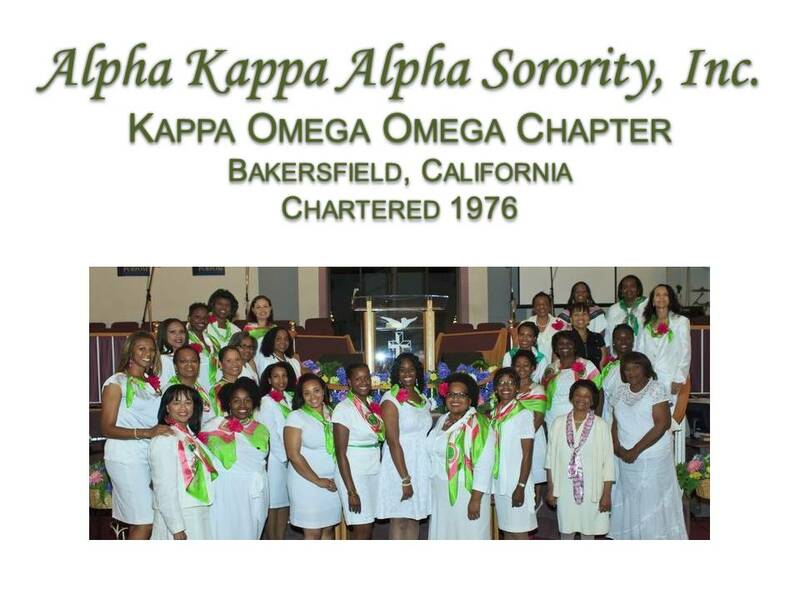 The dream to establish an Alpha Kappa Alpha Chapter in Bakersfield, California began in 1974-75 with initial insight provided by Sisters Susianna Anderson, Wilma Anderson (Wright), Wanda Bradford, Elsie Cashie, Linda Cato (Hoyle), Jeanette Fulton, Lavenia Goodloe, Alta Harvey, Cheryl Hyde, Marilyn Jones, Mazie Mack, Adelle Minor, Darnell Rucker, Debra Travis, and Jane Van Hook. 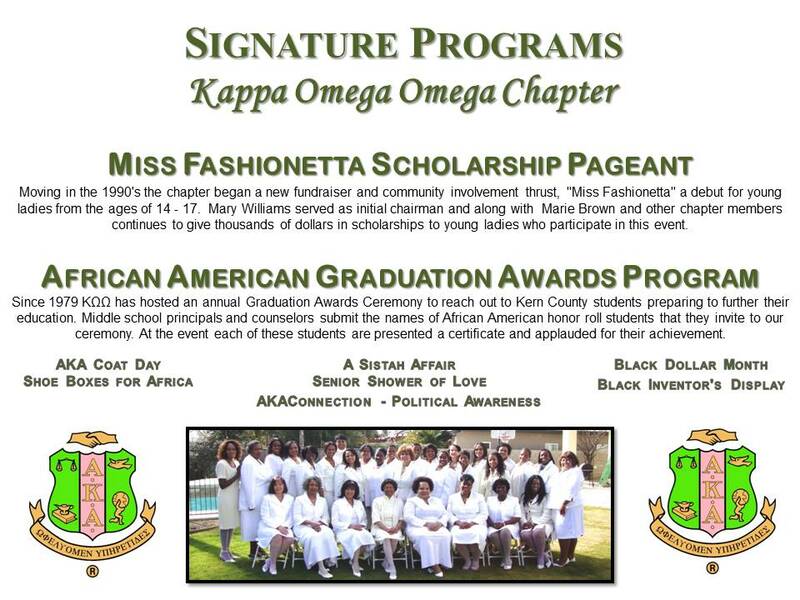 Realizing the success of a chapter depended upon relentless leadership, patience and maturity. The Sisters contacted Sister Mildred Robinson, Far Western Regional Director. 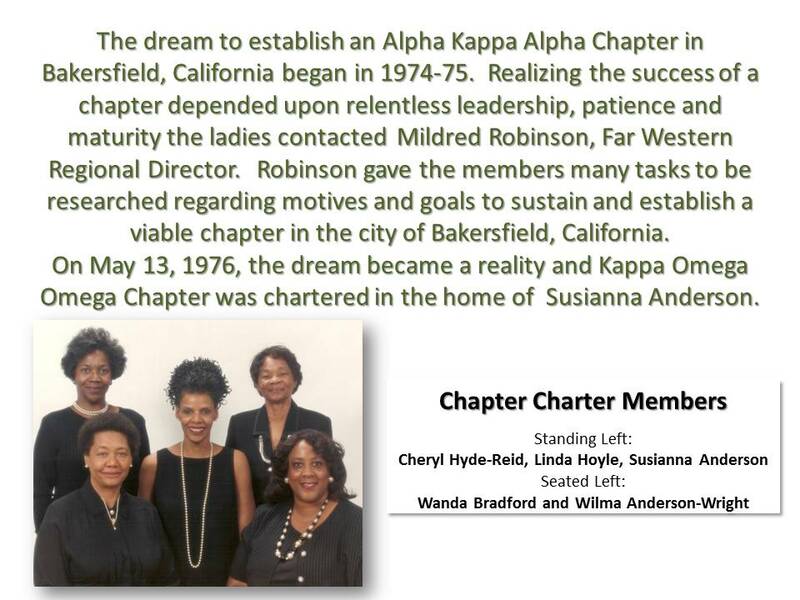 Sister Robinson gave the Sisters many tasks to be researched regarding motives and goals to sustain and establish a viable chapter in the city of Bakersfield, California. 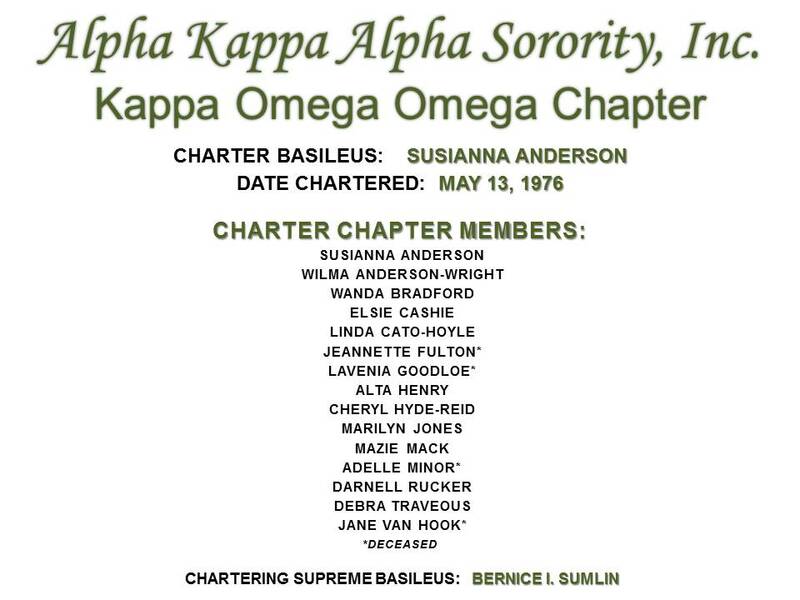 On May 13, 1976, the dream became a reality and Kappa Omega Omega Chapter was chartered in the home of Sister Susianna Anderson. 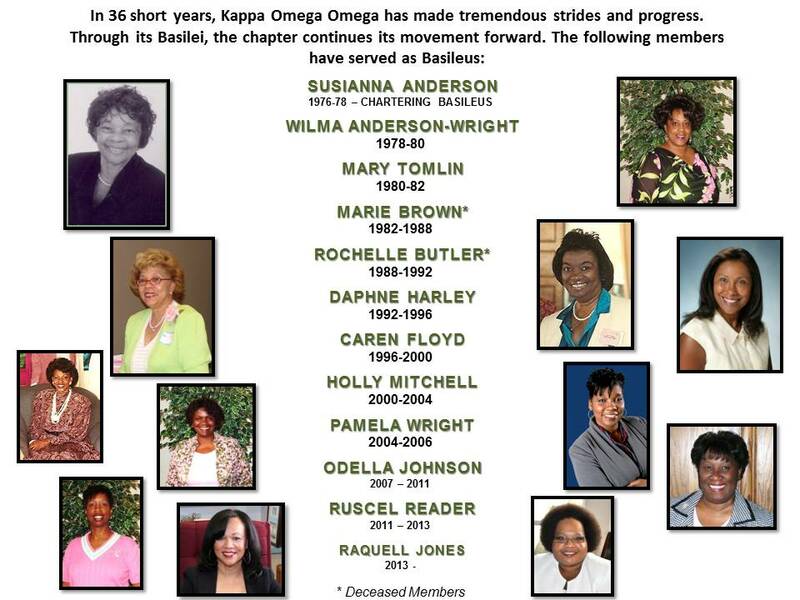 In 40 short years, Kappa Omega Omega has made tremendous strides and progress. 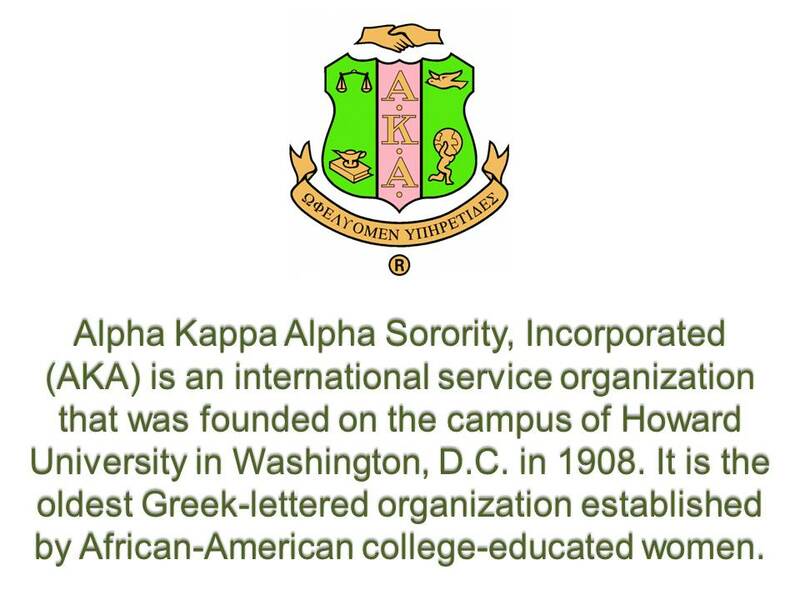 Through its Presidents, the chapter continues its movement forward. Click on slide to enlarge.